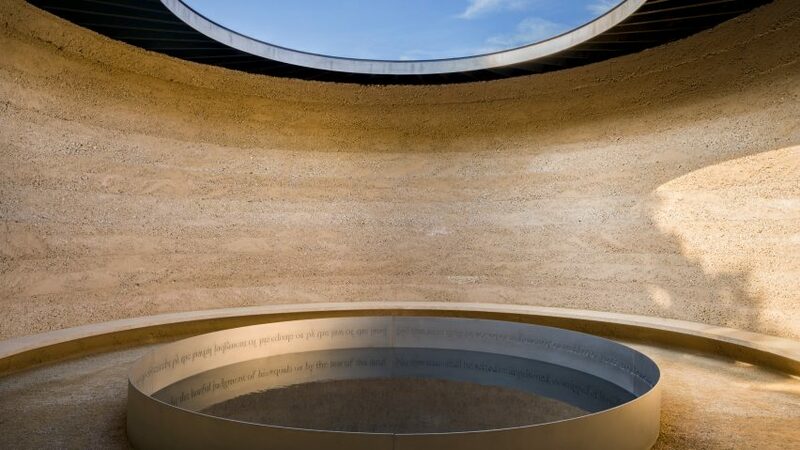 A labyrinth and reflective pool, called Writ in Water, has opened on the site near where the Magna Carta was signed, in Runnymede, England. Set in a meadow near the River Thames, the building has been designed by artist Mark Wallinger and architects Studio Octopi. Visitors enter through a doorway and can turn either left or right to walk around a labyrinth leading to a central space where a circular pool sits below a skylight. London-based Studio Octopi planned the building using cubits, an ancient unit of measurement, and built it from rammed earth made from locally quarried gravel mixed with cement. Described as a piece of "architectural artwork", Writ in Water is designed to be a place for visitors to contemplate the principles of common law and justice. A reversed and inverted inscription running around the interior of the pool spells out Clause 39 of the Magna Carta in the still reflection of the water. The ring of lettering mirrors that of the seal of the historic charter, which was signed at at Runnymede in 1215 as feudal barons sought to curtail the powers of an absolute monarchy. Clause 39 stated that: "No free man shall be seized or imprisoned, or stripped of his rights or possessions... except by the lawful judgment of his equals or by the law of the land." As the UK has no formal constitution, this document is seen to mark the first move towards democracy and enshrining of human rights in the country. The still pool recalls the fonts of a church, although the binding document was an attempt to curtail the divine right of kings. "In Writ in Water, the use of reflection to make the text legible plays against the idea of a law written in stone. Magna Carta curtailed this divine right and issued the first secular writ," said Turner Prize-winning artist Mark Wallinger. The title of the work is taken from the inscription on English Romantic poet John Keats' headstone: "Here lies one whose name was writ in water." "Keats, though despairing of his legacy, was to become one of the immortals and his words live anew when learnt and repeated by every succeeding generation," added Wallinger. "Similarly, although Magna Carta established the law and the nascent principles of human rights, the UK has no written constitution," he continued. "What seems like a birthright has to be learned over and over and made sense of. Whether the words are ephemeral or everlasting is up to us." The project was commissioned by the National Trust's contemporary art programme, Trust New Art. The conservation organisation owns the land where it has been built, with the piece intended to open for the 800th anniversary of the signing of the Magna Carta, although it has opened three years late. Studio Octopi have form when it comes to working with projects that combine water and historic settings. They have spearheaded a campaign to resurrect an outdoor swimming pool in Peckham, south London, and have put forward plans to create an open air swimming area on the River Thames using floating pontoons. Wallinger, who won the Turner Prize in 2007, produced an artwork to celebrate the 150th anniversary of the London Underground that saw 270 individually designed graphics of labyrinths in station. Writ in Water is opened on Saturday 16 June 2018 and is free to enter.